This year's 29th issue of Shueisha's Weekly Shonen Jump magazine is announcing on Monday that manga creator Yasuhiro Kano is launching a new romantic comedy series called Kagami no Kuni no Harisugawa in the 31st issue on July 11. 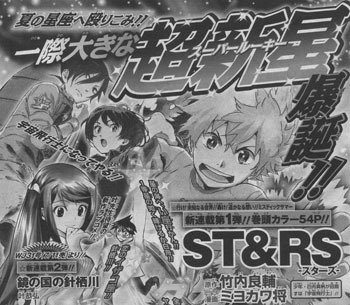 The 29th issue of Shonen Jump also announced that creator Ryōsuke Takeuchi and artist Masaru Miyokawa will launch their St&rs manga series in the 30th issue on July 11. The story wil follow a boy and a girl who dream about becoming astronauts. This is the debut manga series for both Takeuchi and Miyokawa. Kano's previous Shonen Jump series were Pretty Face (2002-2003) and M×0 (2006-2008). Update: Through the Looking-Glass, and What Alice Found There, Lewis Carroll's sequel to Alice's Adventures in Wonderland , is titled Kagami no Kuni no Arisu in Japanese. Other Japanese works that have paid homage to this novel include Yes! Precure 5: Kagami no Kuni no Miracle Daibōken!, and the Musical Minky Momo: Kagami no Kuni no Princess play.